Grade! 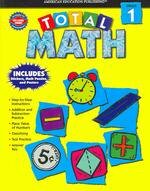 Total Math,Step by step instructions,Addition and Subtraction practice,Place value of numbers and classifying!Includes Stickers ,Math Puzzles and Posters! !